Samuel Osborne. The Independent. Fri, 19 Apr 2019 19:00:53 GMT. The campaign bus of high-profile West Australian MP Andrew Hastie has survived an arson attack on Thursday night after the grass in a paddock where it was parked was doused in petrol and set alight. Nathan Hondros. Sydney Morning Herald. Sat, 20 Apr 2019 01:05:02 +1000. Daniel Victor. New York Times. Fri, 19 Apr 2019 10:00:26 GMT. Sky News. Fri, 19 Apr 2019 09:32:00 +0100. Irish Independent. Fri, 19 Apr 2019 07:10:18 +0100. BBC News. Fri, 19 Apr 2019 03:57:52 GMT. BBC News. Fri, 19 Apr 2019 02:35:20 GMT. Reuters. Thu, 18 Apr 2019 22:03:56 -0400. SYDNEY (AFP) - A father rescued his son from a dingo's jaws after the infant was dragged from a campervan at an Australian tourist island, authorities said Friday (April 19), in the third such attack this year. Straits Times. Fri, 19 Apr 2019 09:55:05 +0800. An American backpacker who survived a horror head on collision on an Australian freeway is pleading for help to pay her mounting medical bills. Daily Mail. Thu, 18 Apr 2019 22:48:22 GMT. Alexandra Deabler. Fox News. Thu, 18 Apr 2019 16:57:21 GMT. Al Jazeera. Thu, 18 Apr 2019 08:52:41 GMT. ABC News. Thu, 18 Apr 2019 01:24:27 -0400. New Zealand Herald. Thu, 18 Apr 2019 13:38:50 +1200. Science Daily. Wed, 17 Apr 2019 11:14:37 EDT. Yahoo. Wed, 17 Apr 2019 01:09:05 -0400. The Australian Jewish Association cited alleged social media post by Muslims and people with Arab names that delighted in the church's destruction. Jerusalem Post. Tue, 16 Apr 2019 19:06:59 GMT. A Madrid skyscraper housing the British, Dutch, Australian and Canadian embassies was evacuated on Tuesday midday over a bomb threat. Spanish police have now said it was a false alarm. The Local. Tue, 16 Apr 2019 13:34:00 +0200. ZDNet. Tue, 16 Apr 2019 04:09:00 +0000. Fallen heroes Steve Smith and David Warner were named in Australia's World Cup squad and are set to be pivotal players in their team's title defense. By Tristan Lavalette, Contributor. Forbes. Mon, 15 Apr 2019 10:33:00 +0000. The Commonwealth of Australia is a Southern Hemisphere nation which occupies the continent of Australia and a number of nearby islands. Its capital city is Canberra, and its national currency is the Australian Dollar. English is the primary language spoken by Australians, and in 2007, Australia's estimated population was 20,434,000. For more news and information about Australia, visit the official Australian government website. 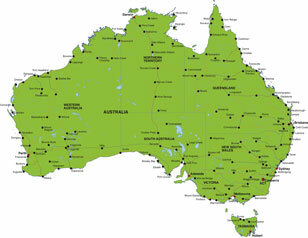 For detailed maps of Australia, visit this Australia map website.